Beats Music vs. Spotify: Can Dr. Dre outmix the king of streaming? If you prefer to get to your music with a click rather than flipping through pages of discs in your CD case, then you have plenty of options to choose from. Music streaming services are all the rage these days, and Spotify is the top dog when it comes to music on demand. With a massive – and very connected – 24 million active users streaming their music through Spotify, any challenger finds itself looking up a steep hill to climb when it comes to catching up. Beats Music thinks it’s capable of building its service big enough to cast a shadow on Spotify, and it’s putting a massive marketing budget behind that goal. As AC/DC says, it’s a long way to the top. Which of these services can make the trip? There are a lot of similarities between Spotify and Beats Music. In fact, we’re willing to bet there’s probably somewhere near 20 million of them. That is how many songs both Spotify and Beats Music both boast. How much crossover there is between these is hard to say, and even if you start listening now and don’t stop for the next 100 years, odds are good you won’t find a song on one service that you can’t find on the other. In fact, in its five years of existence, 20 percent of Spotify’s library has never even been listened to by anyone. Distinguishing a winner between two services with more music than you’ll ever need is nearly impossible. Spotify has it’s deep entrenchment into Facebook to thank for some of its success. Having songs played on Spotify pop up in news feeds on one of the world’s most visited websites is about as good of publicity as you can get. It’s also a total turnoff for those who aren’t into Facebook. No matter how sure you are that you friends love your taste in music, not everyone wants to see what song you’re listening to at all times. Spotify doesn’t require Facebook, but it’s used as a strong incentive, though recent features have promoted Spotify’s own internal social network. 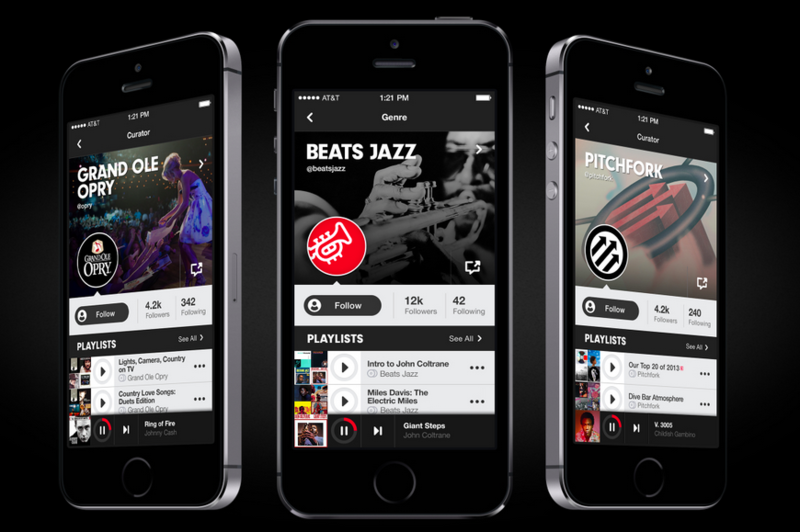 Beats Music uses social networks during its sign up process, but it’s in no way required. It’s easy enough to just sign up with an email address. There is the ability to share your tunes via Facebook and Twitter, but it’s a more active decision, requiring you to share it like you would a link. Beats Music is more interested in getting you intertwined in its own network of influencers and curators than it is turning you into one for your friends. 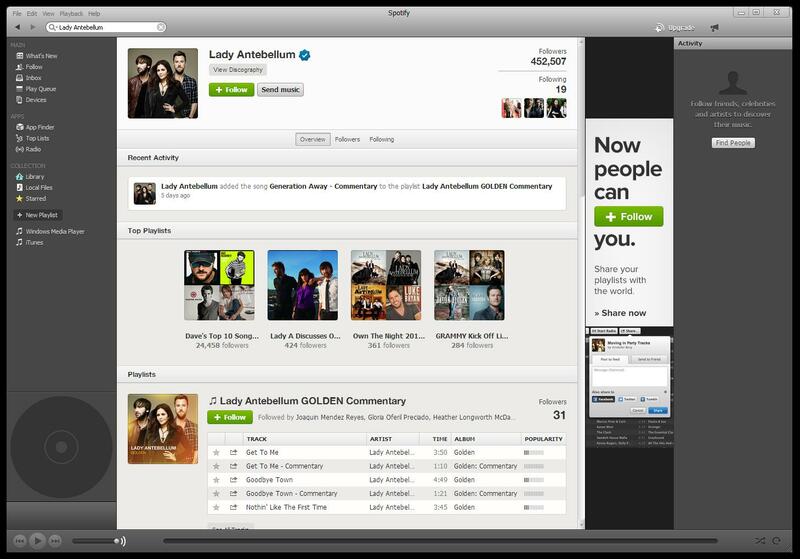 If you’re into sharing and social networking, Spotify is the clear answer for you. But if you tend to avoid updating your statuses and following your friends, Beats Music is a better bet. With the amount of content on Spotify and Beats Music essentially the same, they take two very different approaches to helping you find new music. 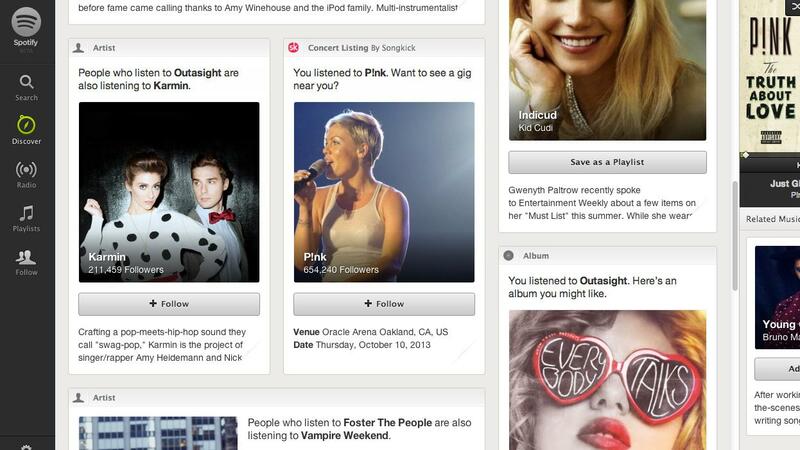 Spotify essentially puts its discovery options on the back of your friends. If the people you are connected with have good taste and listen to a ton of music, you’re going to have a lot more to work with when it comes to Spotify. You can subscribe to playlists created by people and enjoy the music they put together. Other than that, there’s some bare bones stuff that Spotify puts together in its home page and some really basic artist suggestions that aren’t all that personal and often flat out wrong. However, the newer Discover tab does surface some unique tracks and albums by seeing what other people like you are listening to and some song analysis. You can stream songs on demand with Beats Music, but it’s way more interested in bringing you new stuff. When you sign up for the service, it asks you to indicate your favorite genres and artists. This serves to bring you the content on your homepage, which is updated regularly with playlists and albums of artists you should enjoy. You can create a mix made specifically for a moment with The Sentence, which asks you to fill in the blanks on a sentence to tell your situation and help Beats Music set the mood for you. There’s also content curated by people and sortable genre, activity, and playlist creator. Basically any way you can imagine to find new music is covered under the Beats Music umbrella. Sadly, neither of these services have likely cracked the code of music discovery yet. No service has. This is an easy one. Spotify allows you to stream unlimited music for free from your desktop, albeit with ads occasionally interrupting you. Beats Music has no free version to speak of. Spotify has a 30 day free trial available to its Premium service. Beats Music only gives you 7 days (unless you’re an AT&T customer, in which case you get a full 30 day trial). If you’re short on cash or don’t want to commit to a monthly subscription, you can’t consider Beats Music. If you’re willing to fork over some hard earned cash each month to get your fix of streaming music, your decision is going to come down to features because almost everything else about the paid Spotify and Beats Music services are the same. For $10 a month – both services charge the same fee – you have access to essentially the same amount of music. Both Spotify and Beats Music allow you to stream to your heart’s content as a single user on up to three devices, with streaming occurring on only one device at a time. Spotify does offer an offline mode on desktop; Beats Music does not. Beats Music does allow users to download songs and store them on mobile devices for offline listening, which Spotify offers as well. Both paid services emphasize top quality streaming sound, offering all available tracks in 320kbps quality. It’s worth noting that Beats Music does have a second paid option: the family plan. It’s available exclusively to AT&T customers with a data plan through the carrier. For $15 a month, a family of up to 5 people can stream music freely through Beats Music on up to 10 devices. For $5 more a month, you’ll be able to spread the love. This might be a killer feature for those who listen to music across a myriad of devices or have a music-obsessed family, which makes the AT&T exclusivity such a shame. Since taking music with you is key when it comes to streaming music, the availability of a service is make or break. You should not have a problem finding a platform that can play home to either Spotify or Beats Music. Spotify is available on iPhone (3G and later), iPad, iPod Touch running iOS 6 or higher, Android devices running Android 2.2 and up, Windows Phone 8 devices, and a small spattering of BlackBerry devices. It also offers a desktop client, which Beats Music does not provide. So if your computer is your home base for music and you store tons of it locally, Spotify becomes a favorite. Spotify does offer Web player support for Chrome, Firefox, Safari, and Internet Explorer as well. With no desktop client to speak of, Beats Music focuses heavily on mobile. You can access the service via the Web as Beats Music supports Chrome, Safari, Firefox, and Internet Explorer 9 or higher. But this means no offline desktop mode, meaning Beats Music can’t serve as an iTunes with streaming options. As far as mobile devices go, though, Beats Music has plenty of choices. Owners of iOS devices running iOS 6 or higher – iPhone 4 and up, iPod Touch 4th generation and up, iPad 3rd generation and up – Android devices running Android 4.03 or higher, and Windows Phone 8 or higher can all use Beats Music. Beats Music is also available for Sonos devices version 4.0 and higher. With Webkit 2-based browser support, smart TVs can access Beats Music. Despite plenty of similarities, Beats Music and Spotify have different strengths. Working with basically the same library and same price point, Spotify caters better to the music listener who enjoys what they have and wants access to favorites at all times while Beats Music looks to those who want to discover more, but don’t want to work to find it. If you work off your desktop regularly or find yourself going offline often, Spotify is your best option. For those who want to share with their family, Beats Music is more up your alley. And of course, if you don’t want to pay at all, then Spotify is the only choice here. Once you decide what kind of listener you are, you’ll have an easy time picking which service to use.